A proposal for a 90-day “time out” on sanctions against Iran has been rejected by Britain, France and the United States. It was put forward by South Africa at the United Nations. As members of the Security Council discuss further sanctions against Iran, for refusing to comply with the Council's demand to halt urainium enrichment, Iran's supreme leader Ayatollah Ali Khamenei remained bullish in his approach to the UN. “If they (Western countries) want to use the Security Council of the United Nations as a tool for pressuring Iran, it will harm them first. I tell you this, until today what we have done has been in accordance with international regulations, but if they want to use the Security Council as a tool for ignoring Iran's legal nuclear rights and if they take illegal actions, we too can take illegal actions and we will do so,” said Khamenei. The latest proposal for sanctions includes extending a freeze of assets to those linked to Iran's nuclear and missile programmes and a ban on new grants and loans to the state. 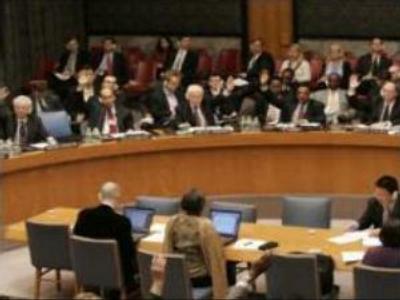 The draft gives Iran 60 days to comply with UN demands or face “further appropriate measures”. Some countries have already expressed concern over this new set of sanctions. “Russia does not support excessive measures,” stated the Russian Foreign Minister, Sergey Lavrov. South Africa, Indonesia and Qatar have also been at the forefront of the decision on sanctions -introducing key amendments to the text. More consultations are expected to take place on Thursday evening, New York time. Meanwhile, Iran’s President Mahmoud Ahmadinejad has been granted a visa to the U.S. and plans to address the UN Security Council when it votes on sanctions against his country. Even before he has presented his case to the Security Council, his imminent arrival to New York is already sparking outrage, as some 100 or so Iranians and others gathered to oppose the proposed visit of Iran's leader to the UN. Russia’s Ambassador to the UN, Vitaly Churkin, said he was positive about this visit and hoped that Mr Ahmadinejad’s address would help to achieve an outcome that would suggest that Iran is willing to work on ceasing the uranium enrichment programme. Members of the Security Council say reaching a consensus is not out of the question. While hope were pinned on a vote before the end of the week, the Security Council would like to achieve a consensus first. New amendments to the text by non permanent members of the Council have resulted in further consultation and additions to a text that would continue to put pressure on Iran while giving them a chance to comply first. Meanwhile, as the U.N. Security Council prepares to pass a second resolution, punishing Tehran for its failure to shut down its uranium enrichment program, senior U.S. officials testified in Washington on the U.S. policy towards Iran. Nicholas Burns, the U.S. Undersecretary of State for Political Affairs, confirmed that all options, including military, remain on the table. When asked by the Senators about the dispute between Iran and Russia over the Bushehr nuclear plant, Mr Burns linked it to political reasons. “It has been very interested to see the Russian government over the last week decide that they are not going to provide fuel for the Bushehr power plant. They have delayed the implementation schedule in 2007, a very clear message as we translate it, from the Russian government to the Iranian government is that it’s not going to be business as usual,” said Nicholas Burns. For his part, the Russian Foreign Minister reputed claims that there is a connection between decisions about Bushehr and a new resolution. “There is no link between Iran's uranium enrichment program and the Bushehr nuclear power plant. I have read the article in the New York Times. It alleges we have told them this. This is a dirty trick. It means somebody wants to put Russia in a bad light,” stated Sergey Lavrov. At another Congressional hearing on Foreign Operations in Washington, the Secretary of State Condoleezza Rice was grilled by legislators over President Bush's military options against Iran. “If he decides to use force against Iran, would he seek Congressional authority? I think American taxpayers are concerned about their funds being used for another preemptive attack on another country,” remarked Democrat Barbara Lee. However, the Secretary of State insisted U.S. military presence was necessary in Iran. “I think the President always has to have his options available to him. But he has very clear that this is something that should be resolved through diplomacy. We faced a situation a number of months ago where I think the Iranians perhaps did not take seriously our willingness to keep our presence in the Gulf, a presence in the Gulf that has been there since Franklin Roosevelt where we have always been willing to defend our interests and our allies. And the carrier strike group and the PAC-3 are simply a signal that the U.S. is present in the Gulf,” said Condoleezza Rice. Despite the increased pressure on Iran, some Democratic lawmakers say that the Bush Administration has not done enough to punish the Islamic state. A new bill currently in work would strip President Bush of his authority to waive sanctions on Iran. The White House vehemently opposes that provision, arguing that it would weaken the President’s foreign policy powers.